WITH PREMIUM OFFERS ON 500+ SAILINGS - IT’S THE PERFECT TIME TO PLAN YOUR NEXT VOYAGE. Receive Additional Onboard Credit or Enjoy the Services of a Distinctive Voyages Host, a Private Welcome Reception and an Exclusive Shore Event! Book by February 5, 2019 and you will also receive a selection of valuable coupons onboard your cruise! WITH PREMIUM OFFERS ON 500+ SAILINGS - IT’S THE PERFECT TIME TO PLAN YOUR NEXT VOYAGE.! 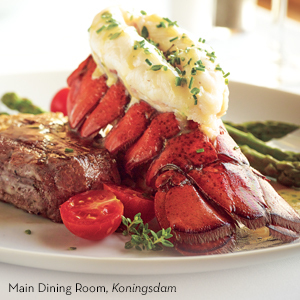 From culinary shore events to exquisite onboard cuisine and foodie favorite destinations, there’s nothing quite as delicious as a culinary cruise aboard Holland America Line. And with premium offers on over 500 sailings, now is the perfect time to plan your voyage! The longtime partnership between Holland America Line and Food & Wine has produced a selection of engaging culinary-themed shore excursions. You can shop in Barcelona’s La Boqueria and create an extraordinary meal with a Spanish chef or tour a distillery in Reykjavík and share a “spirited” toast with the owner. Explore the great cuisines of Europe — from A Taste of Librije, inspired by the Michelin-starred cuisine of Culinary Council® member Jonny Boer, and the authentic Italian fare at Canaletto to the French seafood classics of Rudi’s Sel de Mer and Dutch delicacies and Belgian beers at the Grand Dutch Cafe*. You can even learn to make light-as-air potato gnocchi at an America’s Test Kitchen workshop. Contact our agency to book your culinary voyage today! Terms & Conditions: *Fares and Why Not Now offers are based on Promo(s) NV/NB/UV. Featured fares are per person based on double occupancy, cruise or Land+Sea Journeys only. Fares are in Canadian dollars. Taxes, Fees & Port Expenses range from CAD$106.25 to CAD$1,606.25 and are included in the price listed. Subject to availability. Offers are per stateroom based on double occupancy, for 1st and 2nd guests sharing a stateroom and exclude 3rd/4th guests. Offers are available for new bookings only, apply only to the cruise portion of Alaska Land+Sea Journeys, are not combinable with any other discounts and are not transferable or refundable. Offers are applicable on select 2019 & 2020 departures. Stateroom upgrades are available in select stateroom categories and are subject to availability of the staterooms in the higher category. Reduced deposit amounts vary by cruise length. Air credit is available through Holland America Line’s Flight Ease program from gateways that are offered in Flight Ease. Air credit amounts vary by cruise length. Shore excursion offer applies only to select shore excursions on select sailings. Shore excursions must be purchased in advance of embarkation, prior to February 28, 2019. Suite offer: Onboard spending money amounts vary by cruise length. Onboard spending money is in U.S. dollars and is non-refundable, non-transferable, not for cash value, expires at the end of that cruise, and may not be used in the casino. For full terms & conditions please contact our agency. Offers are capacity controlled, and may be modified or withdrawn without prior notice. Other restrictions may apply. Why Not Now offers end February 28, 2019. Ships' Registry: The Netherlands. Air credit amounts vary by cruise length. Shore excursion offer applies only to select shore excursions on select sailings, purchased in advance of embarkation, prior to February 28, 2019. Suite offer: Onboard spending money amounts vary by cruise length. Onboard spending money is in U.S. dollars and is non-refundable, non-transferable, not for cash value, expires at the end of that cruise, and may not be used in the casino. For full terms & conditions please contact our agency. For more information about our stateroom categories, suite descriptions, and deck plans, please contact our agency. Offers are capacity controlled and may be modified or withdrawn without prior notice. Other restrictions may apply. Why Not Now offers end February 28, 2019. Ships’ Registry: The Netherlands. Onboard Credit Offer: Prices are per person, based on double occupancy, cruise only fares. All space is capacity controlled and may not be available in all categories on all voyages. Amenities, pricing & departure dates are subject to availability and may change without notice. All individual cruise line policies and procedures apply; please refer to our agency for details. Cancellations, refunds and penalties are those imposed by the individual cruise lines. An additional security service fee as imposed by the US Department of Transportation (DOT) may apply to all air/sea bookings. All terms and conditions are subject to change without notice. Guests must be booked in a featured group departure to receive amenities. Amenities apply to 1st and 2nd passengers only. If group space has been recalled or canceled by the cruise line, amenities cannot be applied. The Onboard Value Coupons include terms and conditions for specific offers. All amounts in U.S. dollars. Cannot be used in conjunction with any promotional programs, sale items, Mariner Society®, Holland America Line discounts or any other discount programs. Total Onboard Value Coupon savings are calculated based on the total savings amount available. Only Value Coupons distributed on board will be valid. All offers require a purchase to receive the discounted item. Subject to availability. Not combinable with other pre-cruise and shipboard discounts and promotions. Coupons are not refundable, nontransferable and have no cash value.